Since 2005, the Judith M. Runstad Discovery Lecture series has hosted scholars, authors, filmmakers, actors, poets, and activists presenting before an estimated total audience of nearly 10,000 students, faculty, staff, and community members. These distinguished visitors have spoken to audiences in standing-room-only auditoriums and met with small groups of students in classroom settings. With an annual budget of just under $10,000 administered through the College of Letters, Arts and Social Sciences, this endowment has allowed the university to create a signature lecture series that has brought a world of interdisciplinary ideas to the Moscow campus. Since 2013, this Lecture Series has been responsible for bringing in the author with the Common Read Program or someone closely associated with the book. The General Education program and the University of Idaho are deeply indebted to the Runstad family for their tremendous support of this lecture series. 2005 | Robert Pinsky – U. S. Poet Laureate, Boston. Co-sponsored with Creative Writing Program. 2006 | Geoffrey Ward – Documentary film maker and collaborator with Kenneth Burns, New York, New York. 2007 | Phil Cousineau – an award-winning documentary filmmaker and screenwriter, and storyteller, Mountain View, California. Co-sponsored with Religious Studies/Department of Philosophy. 2008 | Dan Savage – American author, media pundit, journalist and newspaper editor, Seattle. Co-sponsored by ASUI, Women’s Center, Gay-Straight Alliance. 2008| Sean Hill and Elizabeth Bradfield, environmental poets, Stegner Fellows at Stanford University, Palo Alto, California. 2009 | Geri Jewel – actress and disability activist. 2009 | Timothy Mooney – Actor, Prospect Heights, Illinois. Co-sponsored with Department of Foreign Languages and Literatures. 2010 | Martha Mendoza – Pulitzer-prize winning associated press reporter, Mexico City. 2010 | Captain Charles Moore – Founder, Algalita Research Foundation and recipient of the inaugural UI Presidential Leadership in Sustainability award, Los Angeles, Calif.
2010 | Jonathan Mooney – Author, "The Short Bus: A Journey Beyond Normal". 2010 | Tim Wise – anti-racism activist and best-selling author of "White Like Me: Reflections on Race From a Privileged Son," New Orleans, La. Co-sponsored with the Associated Students of University of Idaho. 2011 | Co-sponsor of the UI Presidential Sustainability Conference and the Borah Symposium 2011. 2013 | David Lacks and Jeri Lacks Whyte, Keynote Address, Co-sponsored of the Common Read – "The Immortal Life of Henrietta Lacks." 2014 | Barry Estabrook, Author, "Tomatoland: How Modern Industrial Agriculture Destroyed Our Most Alluring Fruit." Keynote Address, Co-Sponsored of the Common Read. 2015 | Bich Minh Nguyen, "Stealing Buddha's Dinner." Keynote Address, Co-Sponsored by the Common Read. 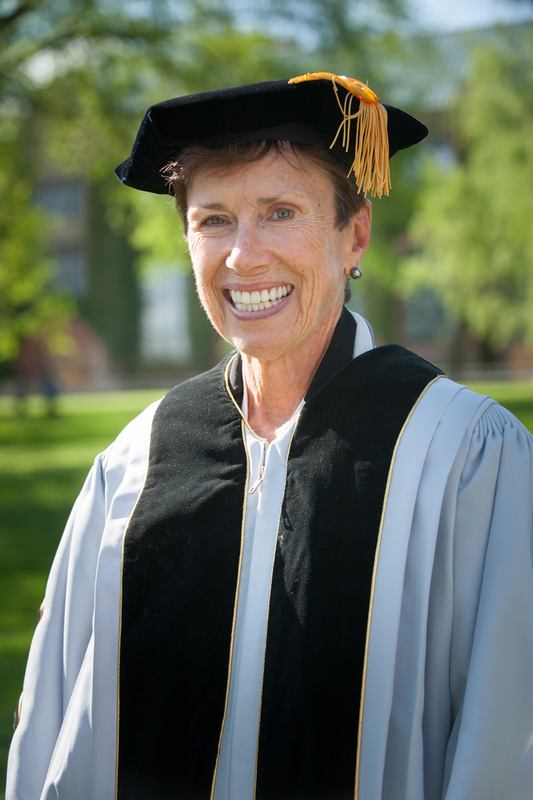 Judith Runstad before receiving an honorary doctorate in 2014.